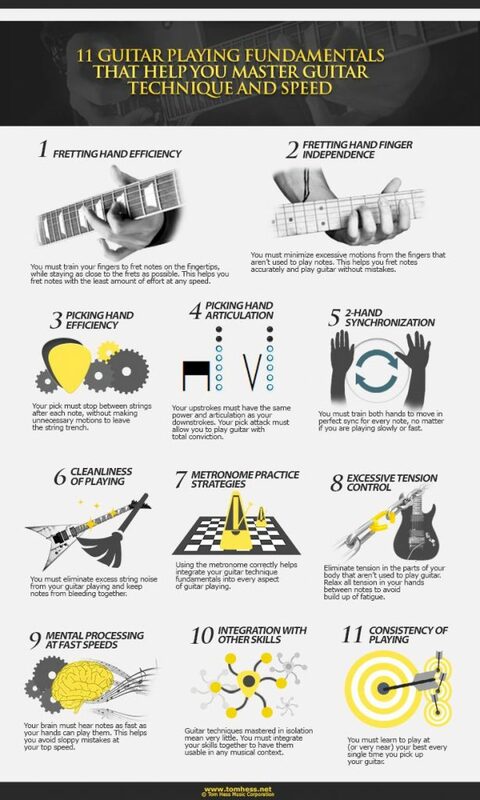 Playing guitar fast seems to be the Holy Grail for many beginners. We seem to be so obsessed with the idea of shredding super fast that we fail to notice the mistakes we make on our way. 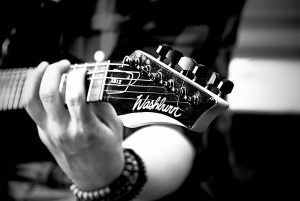 Today we are looking at top 5 “how to play faster” tips that will help you avoid common mistakes and develop your guitar speed. While this may sound boring to practice over a metronome, this is the most efficient way to develop your speed at guitar. Start at slow tempo, make sure you are perfectly comfortable with the riff/lick, then gradually build up the speed. This is the single most important tip when it comes to learning how to play lead guitar or even music in general. But why is metronome so important? Biologically we, humans, are not inclined to play music to a consistent beat. We are simply not used to the constant pulse of set tempos. Most sounds in nature world are variable so we don’t have that inborn sense of rhythm and timing. However, music comes in consistent sections. The most common rhythm pattern is 4/4 where each measure lasts an equal amount of time. Practicing over a metronome helps you become consistent throughout each measure. You learn how to stay within your “boundaries”. You learn the starting and ending point of each measure. Playing fast is all about consistency. Once you learn how to play a lick at 50 bpm, you can speed it up to 70, then to 80, 90 and so on. A big mistake among many starters is not paying attention to the picking hand position. I learned this tip from a guitar lesson by Joe Satriani that I will leave a link to. This is an hour long lesson where Joe talks about mistakes of the student who just played in front of him. He talks about small things, but often times those are the ones that are holding you back the most. I highly recommend you to watch the whole lesson. Going back to the main point, Joe Satriani mentioned that the student’s picking hand position remained at the same place throughout the whole song he played. Joe mentions that he places his picking hand in many different positions. This allows him to get a new sounding from the same notes as well as remain consistent throughout different parts of the song. In order to maintain fast speed, you also need to make sure your picking hand is relaxed. An uncomfortable position can cause tiredness and sloppiness. In order to play guitar faster, you must be able to play efficiently. Ergonomics is especially important for the fretting hand when it comes to playing fast. Your hand needs to be placed at a 90 degree angle to the neck (just like classical and sometimes acoustic guitar players do) in order to pick fast. Pay close attention to how during his live performance Buckethead changes his fretting hand position when he switches between slow and fast parts of Soothsayer. Whenever he does bends or slower licks, his fretting hand somewhat rotates to a 45 degree angle, whereas during crazy fast parts you can clearly see this 90 degree angle between his hand and the neck. Additionally, I recommend checking out this great infographics by tomhess.net. If you are a beginner guitar player then I guarantee that at some point you asked yourself a question: “Wow! How can this guy pick so fast! It just seems impossible to develop that picking speed”. Well, here is a little secret about those crazy fast solos: they don’t pick every note. They use a sequence of pull-offs and hammer-ons (it’s called legato playing) WITHOUT actually picking every note they play. Legato literally allows you to play 3, 5 or even 6 times faster since you only need to pick once per 3-6 notes you play. For many guitar players out there this simple trick may be the last missing puzzle to developing lightning speed. Recommended for reading: How to Improve Your Legato Technique. This is a tip that I learned from a randomly suggested Youtube video. I will share the video with you, but before I’d like to tell you this simple, but powerful trick. When you are picking the string up and down, all you have to do is make sure you pick remains on the string and literally doesn’t leave it. Using this simple trick, you will avoid unnecessary moves that are slowing you down. It is especially useful for developing tremolo picking technique. I hope in this article you learned something new for yourself. If there are important tips that you believe I should have mentioned, let me know in the comment section. Anyway, how long have you been playing the guitar?